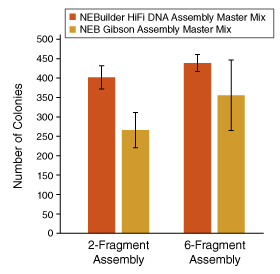 NEBuilder® HiFi DNA Assembly Master Mix was developed to improve the efficiency and accuracy of DNA assembly. This method allows for seamless assembly of multiple DNA fragments, regardless of fragment length or end compatibility. 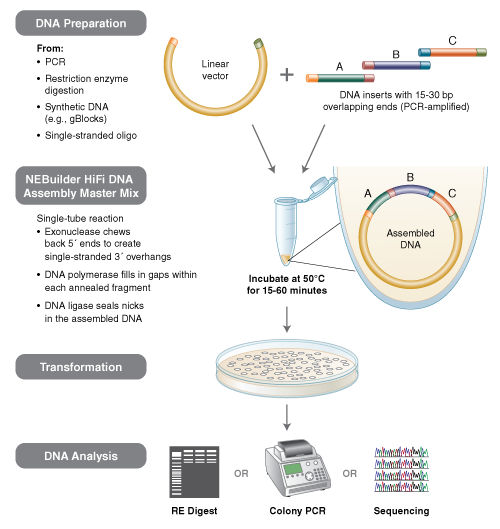 This method has been used to assemble either single-stranded oligonucleotides or different sizes of DNA fragments with varied overlaps (15–80 bp). It has utility for the synthetic biology community, as well as those interested in one-step cloning of multiple fragments due to its ease of use, flexibility and simple master-mix format. LB (Luria-Bertani) plates with appropriate antibiotic.For selection of transformed competent cells, we recommend LB plates with appropriate antibiotic. Upon arrival, store the kit components at –80°C. Before use, thaw and vortex the master mix thoroughly and keep on ice. After first use, store the HiFi DNA Assembly Master Mix and postive controls at –20°C, store the SOC Outgrowth Medium at room temperature. Store the competent cells at –80°C. 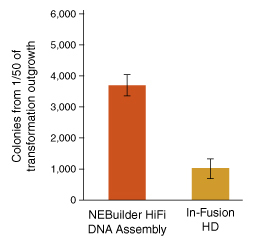 Transformation: NEB 5-alpha Competent E. coli (High Efficiency, NEB #C2987) provided with the NEBuilder HiFi DNA Assembly Cloning Kit are recommended for use for assembled products of less than 15kb. It is also possible to use other NEB competent E. coli strains, with the exception of BL21, BL21(DE3), Lemo21(DE3), Nico21(DE3), and SHuffle®. When using competent E. coli from a vendor other than NEB, we have seen decreased robustness of transformation with high-fidelity DNA assembled products. Electroporation: Electroporation can increase transformation efficiency by several logs. When using the NEBuilder HiFi DNA Assembly Master Mix, use 1 μl of the assembled product for electroporation, and plate multiple dilutions. Interested in how DNA assembly works? Learn more in this short animation. When assembling DNA, you can bridge two dsDNA fragments with a ssDNAoligo using NEBuilder HiFi DNA Assembly. Learn more in this shortanimation. When designing your DNA assembly experiment, we suggest designing theexperiment in silico to help with primer design. Learn more in thisshort animation.